Do you use Pro Tools? If yes, you cannot keep on living without watching this video. We know you're not quite sure what the Pro Tools I/O setup window does, how it affects your sessions, and we know you are a little bit afraid of it. (We know everything). So, how does it work? What does it do? Is it really useful? In this video, Fab Dupont will answer these questions (and more). Good morning children! Today, we're gonna talk about the Pro Tools I/O Setup. Wait! Don't go. Stay! Stay in your seat. No one's gonna get hurt. Here we go! Very important: You must have Pro Tools 9 or 10 for any of this to make sense. If you have Pro Tools 8 and before, you have two options: upgrade, or move on! Here are the four main panes. You can think of them as two groups: the Input, Output and Insert panes represent physical outputs of your interfaces. Now, I have four 192s right here, but you may have two, you may have three, you may have one, you'll see the number of 192s that you own. But think of the Input, Output, and Insert as a physical representation of your hardware. The Bus pane is a different thing we'll talk about in a second. For those of you who don't know what the Insert pane is about, this is about the Pro Tools I/O system. Pro Tools lets you turn your hardware into a plug-in by letting you connect the same input and output. Say for example I have a Chandler TG1. I will connect it to both Input and Output 1-2 of my Pro Tools rig. What that's gonna let me do is let me route the signal from a channel in Pro Tools to Output 1-2, through my TG1, back into Input 1-2, back into that channel, all in one go, and fully delay compensate the whole path, phase accurately. Very practical. That's what the pane is about. For example, say I had TG1 on that Input 1-2. I call it TG1. Now in my session, here in the insert, where I would use TDM plug-ins or RTAS plug-ins, I can go to I/O and insert my hardware TG1 as if it were a plug-in. There's no settings here, because it's a piece of hardware in my rack. But the audio is coming from my track, going out Output 1-2, into the TG1, out of the TG1, back into Input 1-2, back into this track, and now I can use a plug-in after that, for example the Oxford Filter. There you have it. That is called an I/O insert in Pro Tools, and the name of those are controlled in that pane called Insert in the I/O Setup. If you look at it here, I have a whole bunch of inputs, a whole bunch of outputs, a whole bunch of inserts, which use the same inputs and outputs as the Input and Output pane. And then I have my Bus pane, which is where all the magic happens from Pro Tools 9 to Pro Tools 10. These two last panes here are useful if you own a PRE from Digi, or any mic pre system that's compatible with this remote control, and this is in case you need to do hardware delay compensation. You will only need this pane if you do complicated roundtrip I/O stuff, which we'll discuss another day. Of course, if you have Pro Tools 9 or 10, this could be an Apollo, it could be an RME Fireface, it could be anything. You won't get the pretty icons, but you'll get a different set of names, and a different set of outputs. This is the default Digi setup. The principles are the same, no matter what interface you own. It's all the same idea. You just have to have the right idea. So what's the idea? As of Pro Tools 9 or Pro Tools 10, and all subsequent releases we hope, the I/O Setup in Pro Tools functions this way: there are two ways to save your I/O Setup. It can be saved with the system, meaning it pertains to the hardware you own, and it can be saved with the session, and I'm gonna show you that in a minute. The first thing you need to do is learn your personal system I/O Setup, and custom design it so it speaks to you. The best way is to launch Pro Tools with no session open and open the I/O Setup window there. This is not my HD IO setup at all. This is an I/O Setup from apparently a native interface. Ok? What I'm gonna do now is I'm gonna load my built-in I/O Setup. Since there is no session, there is nothing in memory, Pro Tools will let me do that very easily. As of Pro Tools 9, they've changed something. You can load a different I/O Setup for every pane separately, and that's now the default state. If you want to refresh the whole thing with your own preset, what you have to do is Option+Click on Import Settings. If you Option+Click on Import Settings, it will import the entire I/O Setup for all the panes. If you do not Option+Click, it will only import that one pane. So, Fabulous Room, today's date. It is safe to delete unused paths. I'll go over that in a second too. So Yes! This is my I/O Setup. Meaning, you can see my four 192s, you can see all the inputs, you can see that I own a Crane Song Hedd, and a UA 2192. You can see that I own a 16-channel Neve console, and a 16-channel Dangerous 2-Bus. You can see that I tend to use digital outs. This is the default I/O Setup for this rig. And this is the Bus, which we'll talk about in a second. As you can see, I went in and took the time to enter for every physical output in my Output pane, the name of the piece of gear connected to that output. So the first 16 channels are my Neve, it's a 54 Series, I was too lazy to type 54, but I know it's Neve channel from 1 to 16. After that, it's my 2-Bus, channel 1 through 16. Then my Crane Song, my UA, and my digital outs. These down there I did not name, because nothing is permanently connected to them, so I had no name to give them. I did the same thing with the Input. The only thing that's permanent on my Input is my Crane Song and my UA, everything else is hard-patched depending on the song, so I have no special names. The benefit of taking the time to name those inputs and outputs is apparent when you start opening sessions. You open, say, the Output menu here, now it makes sense. It doesn't say Audio 1-2, or Audio 78-79, it says 2-Bus 1-2, I know where I'm going. That's basically the point of doing that. The other reason of doing that is that it will make your life much simpler when you start dealing with the Bus pane of the I/O Setup in Pro Tools 9 and 10, and subsequent releases. It can be a little odd to see Neve 1-2 here, and Neve 1-2 here. Yes. But here's how you have to think about it. You named your physical outputs so that you have some easy ways to see where the signals are going. Pro Tools then, when you create your I/O Setup, will look at those names and say: "You know what? It is most likely that my owner, when he wants to route something to Neve 1-2 is going to want to see Neve 1-2 in the menu too!" It makes sense? I can't get angry at that. Here's how you think about it. These here are the busses on the left. You have a whole bunch of them. They can either be mapped to a physical output, or they can be just plain old-school Pro Tools busses. That's how you think about it. The naming is just an added cherry on top for you to not have to think too much, and we like that, because we don't like to think too much! Sometimes, the I/O Setup can get a little overwhelming because a lot of stuff is going on, you got a lot of legacy names coming from elsewhere, they stay in your session and you can't get rid of them. and select Stereo Mix. Save the session, whatever. Whenever I create a session that I know I'm not gonna keep, I put it on my Desktop and I call it "Trash me." It sends a message. It creates my session. I open the I/O Setup. In the I/O Setup right here, what I do is I check that everything is kosher and totally blank, from the beginning as if nothing ever happened. Creating a new session using the Stereo Mix setup will do that for you. Alright? Once that's done, and you've checked that everybody's happy, you export those settings, and you call them, guess what... Stereo Mix! And save them. I'm replacing the ones that were there before. You've now created a blank I/O Setup, that you can always get back to. For example, say you've been working for a week on a record from... wherever, and there's a whole bunch of names and a whole bunch of stuff that makes no sense to you because it doesn't belong to you. You see a Mytek preamp, you don't own a Mytek preamp, why is the name there? What you do is you open the I/O Setup with no session open, and then, you Option+Click on Import Settings, and import that Stereo Mix you just created. You're back to a completely blank setup. And that's a good blank slate. If you have taken the time to rename your stuff like I showed you earlier, then you should import that. By the way, here's a cool trick. You double-click on the first one, you type your first name, say Neve 1-2. If you hit Tab, it highlights the next one so you don't have to click 700 times. You can just click once and just use Tab. That's just a little trick. It is very important to not forget the Option button. Say I want to reimport my personal I/O Setup. If my finger is not on the Option button and I click Import, and I open my Fabulous Room V5, it's only gonna import the Bus. The Output is gonna stay the same. And it's starting to make a mess. In the case where you're trying to create your own environment, and stay within your own environment, it is really crucial to always click+Option when you import the setting. Check it out! If I now import the setting while pressing Option, selecting the same thing, deleting unused paths, all of a sudden, it makes a lot more sense, we're back to where we were before. Don't be lazy! This is where it can get a little confusing. There are two ways you can import an I/O Setup in Pro Tools. You can import it pressing the Import Settings in the I/O Setup window. But also, whenever you open a session, that I/O Setup can be brought in. That's why they've added this little thing here. It's called 'Sessions overwrite current I/O Setup when opened.' It's not that clear, but if you think of it this way... Listen to this: Session I/O Setup overwrites system I/O Setup when opened. whatever I/O Setup is in the session will nil all the work you've done. If you unclick this, these two panes, Input and Output, are safe. Your system I/O Setup is safe from being touched by importing sessions, when you have this thing here unclicked. I strongly recommend you keep it that way. What happens when you open a session that comes from a different system? Very good question, thank you for asking! I just so happen to have one right here. Here's my I/O Setup. This is mine. I own it. These are my names. They are mine. This is my Bus. You can see that everything is in order, perfectly aligned! And I have all these busses. I'm gonna close my I/O Setup and open that session. It's called "Saving Myself", which is completely irrelevant to our discussion but still a good thought nonetheless. What you're gonna see when you open a session from a different system, most of the time, is all this... 'Your I/O Setup has changed...' Beware! 'Check the I/O Setup window...' 'Please visit the I/O Setup dialog...' 'Some paths were made inactive...' Don't freak out, it's ok, just click No. You can click Yes, but nothing interesting happens. When you look at this I/O Setup, what has happened? It seems that a lot of things have changed in my Bus environment here. But in the Output, nothing has changed. Because this little thing here is unclicked, which means that all my names are still in my system. That's good news, because I spent a lot of time entering those names. If you look at the Bus pane, it's a little messier. Right now, if I press Play on this session, I'm not gonna hear anything. I'm not gonna hear anything, because if you look here, the last track to the right, which is the main track, is supposed to go to something called 'Digital Out.' But that's inactive. It's grayed out, and it's italics. The reason for that is that on the old system, it was going to a certain output, and that output is not available on this system. What Pro Tools does when it opens a session is it looks at the I/O Setup that's contained within the session, the session I/O Setup, and then it looks at your system I/O Setup. And then it tries to make sense of it. It is most likely that you do not have the same rig as the dude who sent you the session. What Pro Tools really does is it looks at the names. Say the guy has an SSL, and you have a Neve. It's very unlikely that Pro Tools is gonna be able to map SSL 1-2 to Neve 1-2, or SSL 3-4 to Neve 3-4. Those don't talk to each other. What you have to do is teach Pro Tools what's going on. The beauty is that there's a system ID. Meaning that Pro Tools will know, next time you import a session from the SSL guy, that you enjoy routing SSL 3-4 to Neve 3-4. And that's saved at the system level. The first time you import a session from a dude who has an SSL, but you have a Neve, you have to do it by hand. The next time, Pro Tools will do it for you. Look at what just happened. I just opened the session, and I opened the I/O Setup. 1-2 from the session setup is being routed to Neve 1-2. Input 1-2 is an exception. Avid knows that most people listen to their music through Output 1-2, so it will by default route Output 1-2 to your Output 1-2, no matter where the Output 1-2 was on the original setup. if you go down here, apparently the guy who sent me this session did not have an SSL, he had an 'A'! Because I see here A 3-4, A 5-6, A 7-8. This is somebody who didn't name his I/O Setup. Lazy! Oh! He did name 'Digital Out.' So now, check this out. Pro Tools was not able to route it to anything. It says: A 3-4 is not available. I know that the big temptation is to quit the I/O Setup, go in here and say: 'Ok, you know what? In my system, at the I/O level, my Output is this!' If you do this, you're not teaching anything to Pro Tools. A 3-4 is really Neve 3-4. B 1-2 is Neve 9-10. Etcetera, etcetera, etcetera, as they say over there. At this point, I've remapped the old I/O Setup to my personal system I/O Setup, within the I/O Setup window. If I click OK, Pro Tools is gonna think for a second, remap everybody, and now my session is playable. 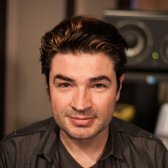 The added benefit, of course, is that because of the embedded system ID in every session, next time you open a session from that dude, as I said, you won't have to do that by hand, Pro Tools will do it for you. Now... Here's where you need to pay attention. Not the ones that I mapped to the outputs, the other busses, the ones that you use for reverbs and stuff like that. Those get overwritten. Check it out. for the sake of demonstration, I named a bunch of busses 'old,' because that's coming from the old session. Here is where it gets confusing. There's nothing that looks more like Bus 1-2 than Bus 1-2. And nothing that looks more like Bus 3-4 than Bus 3-4. And... I'll stop there! The idea here is that if you don't really know what's going on, that's where the confusion comes in. It's all because of the naming. The system is very reliable. The naming is difficult, because there's a lot of double use. This is what you need to keep in the back of your mind when you open a session that comes from a different system, or an older session from a previous version of Pro Tools. If you look at my basic I/O Setup here, I have all my physical outputs routed and then I have 128 busses named Bus 1-2 through Bus 128. I'm gonna close this I/O Setup and I'm gonna open the same session. Look at what happens to the busses that I had in my default I/O Setup, a.k.a. my system I/O Setup. No! Here it is! I've let this so that it looks as if it were the very first time I opened this session from this older system. As you can see, Pro Tools is confused about A 3-4, or A 5-6 and all that stuff. We know how to deal with that. These are the rest of my system I/O Setup, that are at the bottom there. In the middle right here are the busses that came from the session. Instead of naming them Bus 1-2 for the sake of demonstration, I named them old 1-2. Where are my Bus 1-2 through Bus 128? They're gone! That is why I don't default name busses like, you know, all my 3 reverbs I use all the time, I don't have those default names in my system I/O Setup. I do a different thing. Let me show you. reverbs and delays, it can be tedious to name everything. The way you can do that and not lose all those names every time you import a session from a different system, is to create an I/O Setup setting file with just busses in it, and save it. I have one. It's called... guess what? "Basic Bus Names." You open it. It's always safe to delete unused paths. For the sake of demonstration, they're named 1 through 60. What's going on is you added your names, 1 through 60 in my case, to the existing names that came with the session. Because I clicked Yes to delete unused busses, you'll notice that everything that's not used in the session is gone. Meaning all those unused physical outputs that came from my system setup are gone. And this can be kind of cool. Why? Check this out. The menus now, especially the Output menu, are short. Because you don't have every single physical output available in my session in the menu, because it was removed. It's no big deal, you can recreate it if you need to, but it's really nice when you're working fast to not have to wade through this gigantic menu that goes like this, just to find the output that's usually at the very bottom. Ok? If it's done here, when I'm gonna go to my session, and I want to use it, it's gonna be Very Important Bus down here. If I have 128 busses, it's gonna be difficult to find. The beauty of the new I/O Setup window is you can take this Very Important Bus and put it up here. So now when you go back to your menu, the Very Important Bus is at the top. You can actually customize the order in which the busses and outputs appear in your menus, from the I/O Setup. It makes a lot of sense for big sessions. Here's something that's probably gonna happen to you. If you see here and I click on this, and I go into Bus menu, I see bus menu a, and bus menu b. What's that about? That is a new thing from Pro Tools 9 and Pro Tools 10. If you go back to your I/O Setup, you'll notice down here that you have a bus count. Right now it says Active Busses: 132 out of 256 possible busses. If you've been wondering why you get two menus, a and b, here's the reason why. The reason why is you have more than 128 busses. It's gonna put the first 128 in menu a, and the second 128 in menu b, and it's not necessarily very well outlined in the manual, now you know. I only have one bus menu. Here are the main things to remember about this video, in short order. The most important thing to remember is that Pro Tools has 2 sets of I/O Setup, the system I/O Setup that lives with your hardware within your system, and the session I/O Setup that can travel. The Input and the Output panes are the basis of your system I/O. They represent your hardware inputs and outputs. The Bus pane is more of a virtual routing environment, kind of your virtual patchbay. Pro Tools will look at your physical system I/O Setup and try and make something up for your Bus I/O Setup automatically, so you don't have to name all those busses by hand. And that's why you have twice the same names in the left and the right columns. Since you will keep the 'Session overwrites I/O' button off, nothing will never happen to your internal, or system I/O Setup, everything will happen in the Bus I/O Setup. Don't reroute sessions in the session window. Reroute your sessions in the I/O Setup so that next time you get a session from that dude with the SSL, it will reroute automatically. It's always ok to delete unused paths when importing settings. What Pro Tools is doing is looking at your system I/O Setup, your physical outputs and your virtual busses, look at everything that the session does not need, and gets rid of it. It's a good thing, because it makes for leaner Input and Output menus. You can always recreate whatever you deleted in case you happen to need it, in a minute. If your Bus menu has Bus menu a, and Bus menu b, you're not doomed, you just have more than 128 busses. If you really want a blank slate, you must Option+Import your template I/O Setup settings while there's no session running. Otherwise, Pro Tools will keep some names in there and drive you baddy. 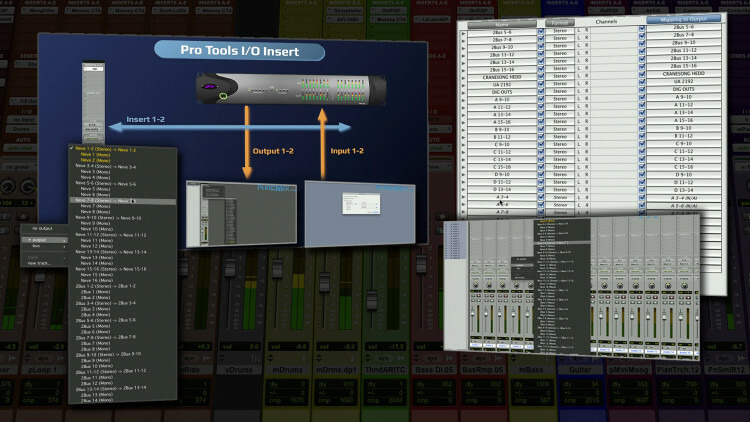 In summary, the Pro Tools I/O Setup is your friend, and here's why. This is what you used to have to do when switching songs in between mixes. Thanks Fab, always been unclear about my IO Setup. Merci! Ce vidéo répond à plusieurs de mes questions concernant les inserts et les bus!!! I'd be very interested to know if there will be an updated video of this to cover the way it now works in Pro Tools 12. I'd got it all worked out with the help of this tutorial, then Avid went and updated it! Merci Fab ! C'est toujours un plaisir de regarder (et d'apprendre au passage...) tes vidéos ! You have a HD 192 and Aurora 16s. How are you using them both? i.e., how are they connected and what are you using them for in your work? This night Fab saved my life! Thanks Fab! This was fab. I knew there must be a way to keep I/O clean and still functional. You're the best! Change the I/O in the I/O menu instead of the session! Thank you!! That alone will save me unimaginable amount of time! I mean the one u can incorporate gear. Is the I/O setup just for Pro Tools HD? Thanks Fab! As always 5 Stars. I have learned so much from you. Making the un-understandable, standable. Thanks, Fab! Thanks. Always learning something new, even in setting up I/O. I had a default system but the idea about the buses makes sense. About to modified it right now. Merci Fab!